A very clean, well-maintained state park just south of Bellingham. The Chuckanut Road leading to the park is fine to navigate coming from the north, but not from the south due to sharp turns with protruding rocks. Excellent hiking trails, either flat, or up the mountain. Nice beach access. Trains pass through the park, but I'm a heavy sleeper so it didn't bother me. We camped at Larrabee State Park in a Motorhome. If you can overlook the trains passing through, about 8 per day both directions, the campground is Washington's first State Park and has a lot to offer for hikes, beach walk, and short trip into Fairhaven for groceries or pizza. Also, Fairhaven has a nice seawall walkway for strolls on the shoreline of the Pacific, often times extending out into the water via bridgeways. Called to advise we would be arriving after 5PM (close); told to just take an open spot. No envelope or registration info on door front when we arrive, so no wi-fi access code for our one night stay. We camped at Meadowlark RV Park in a Motorhome. If you are arriving after office hours (they say until 5PM but it was closed at 3PM when we called on a Friday), get a wifi password prior to arrival since they don't have any welcome information posted providing it after hours. Otherwise, you'll not have wi-fi until 8AM or so the next morning. I've been staying here each winter since 2000/01; there are usually 6-10 RVer's who stay the winter season, skiing and enjoying a slower-paced, quieter Lake Tahoe experience. 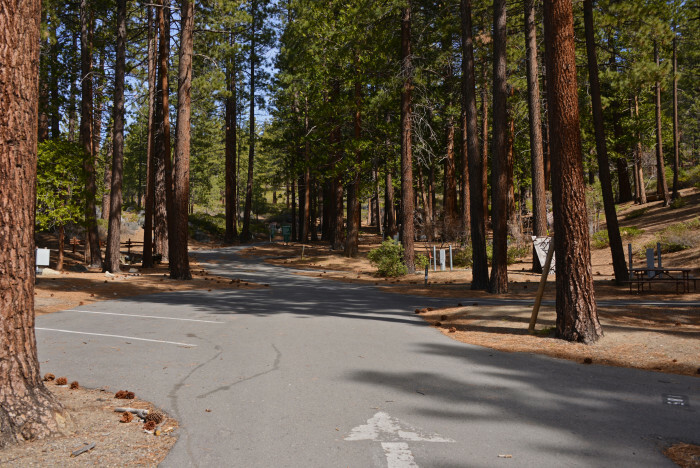 Aramark manages this Nation Forest RV park. They used to have an on-site manager living in the RV park taking care of it; not any longer. The rate had always been $499 per month, this year saw a $150 per month off-season raise, so fewer RVer's this year. The wi-fi is poor to non-existent and staff just says there is nothing they can do because of the trees. Funny, last year it worked fine. There are only a couple of staff that have been here for 5 years or more; newer staff are younger with no RV experience, so of little help. 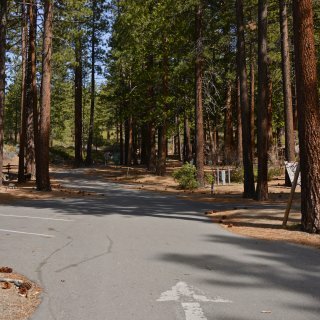 We camped at Zephyr Cove Resort RV Park & Campground in a Motorhome. Be prepared with pads or boards under your jacks; most every site is too sloped to achieve level. Moved three times and never found a near-level site. Nice hiking trails around the park; coyotes come running through each night so pay attention with pets. Folks park their tow on the dirt part of their site. Propane at park is $3.50/gallon - fill before you arrive. No longer 10% discount for lodge restaurant at lodge. Wanted a pull-through for two nights. I requested a pull through since we had no need to un-hook the tow. Assigned space 79 which was barely adequate for the 39' Class A and Jeep in tow. Unfortunately, the site was not level enough to overcome forward tilt of nearly 8". Didn't have forward or backward space to move without undoing tow, defeating the purpose of our need for pull-through. 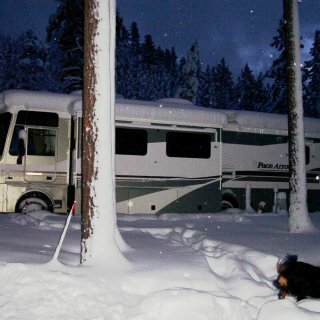 We camped at Hi-Way Haven RV Park in a Motorhome. They pack the RVs in tight here, and if you're looking to watch the movie, don't anticipate doing so from your front windows. We could see from our dining table that is on the driver side of the rig. Sites are only wide enough to get into without awnings, slide outs if you're lucky. Two rigs share a common post, so if you use 50amp you're neighbor only gets a 30 amp. No living grass or greens other than tree leaves around the perimeter. Fire rings! less than 6 foot from your rig that of course the neighbor uses because they're 'camping'. This is just a money grab campground, no upkeep, fees for each dog per night, and the nightly rate does not reflect the quality of the park. I'll never select this campground again, and would recommend finding another if you're in Idaho Falls. 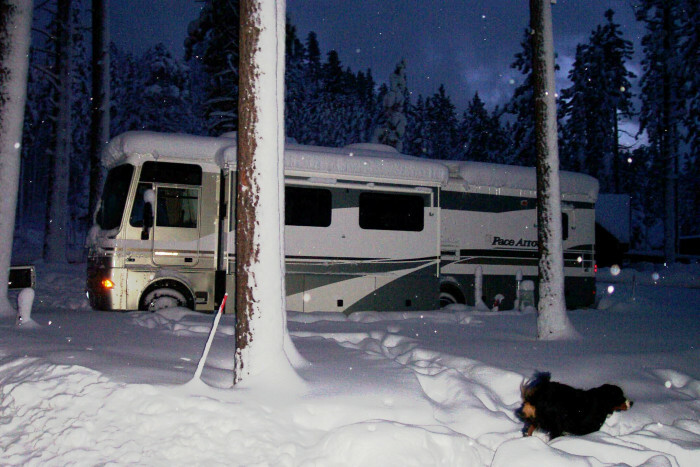 We camped at Snake River RV Park & Campground in a Motorhome. Read's Ice Cream was a delight to visit; family owned dairy farm with home-made ice cream, milk, and cheese curds. I have been full-timing for 16 years, with two to three one-week stays at this park each year. The park is as clean as it ever has been; the staff is friendly and helpful; and the location in/near a major city can not be beat. Safeway and Target are a mile or less away. Every time I pull into the park I am reminded that it is in the flight path of PDX airport with engines roaring overhead. But by the time I get settled in and ready for the first night's sleep, the jet noise has become a background disturbance that my mind ignores. This park truly is impacted by cars, jets, ships, and trains -- the sounds of an active community that provides unlimited opportunities to explore! We camped at Jantzen Beach RV Park in a Motorhome. I like to hang out in the Alberta Street neighborhood with its many restaurants, coffee shops, food trucks and other unique businesses. It's about 6 miles from Jantzen Beach RV Park and has free street parking. I have been staying here for the summer for nearly 14 years, pulling in in May and leaving at the end of September. The monthly rate is great (though limited number available); the owner/operators are very conscientious of their property and it's amenities; and the setting along the Lolo Creek in well-established pine forestry is amazing. A fifteen minute drive to Missoula provides the city-life amenities I use, but the RV park provides the country-life quiet and freshness I prefer. We camped at Square Dance Center and Campground in a Motorhome. The owners have recently made some major improvements on the property including selective removal of trees that really enhances the beauty of the park and installation of wi-fi service to the far stretches of the park. My two dinner tips, drive south to Hamilton (a 40 minute drive) and eat at Spice of Life, you will not be disappointed. For the steak eater, the Lolo Creek Steakhouse is less than two miles from the RV Park, and is consistently above average.